Snippy the Snail loves to play with his friends the lush green grass and leafy green trees that make perfect hiding places for hide and seek. You see, it's his favorite game. Snippy would love to come play it with you! Snippy was crocheted with 100% acrylic yarn and stuffed with polyester fiberfill. 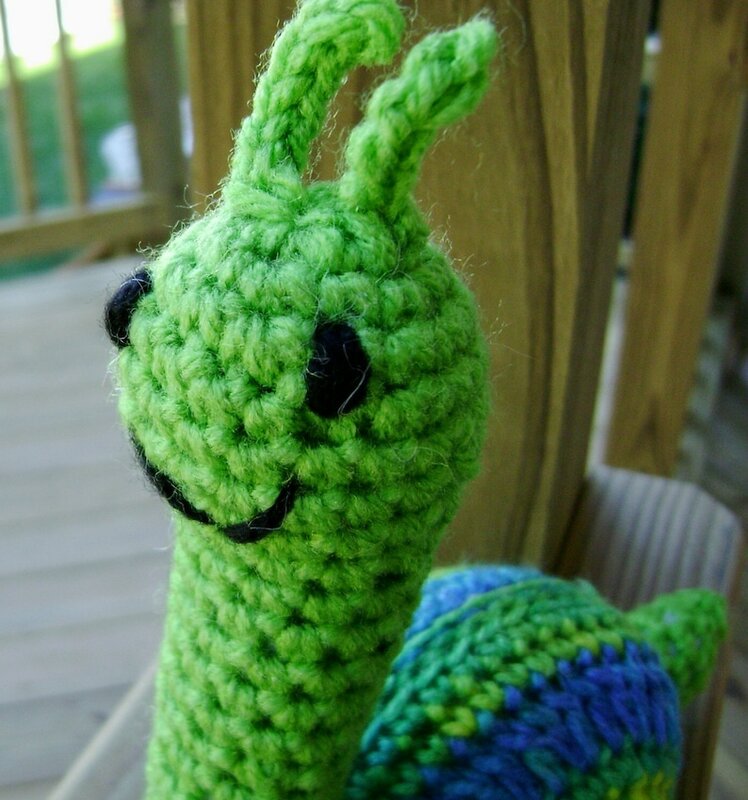 His shell is made with a variegated yarn in shades of green, yellow, turquoise and sky blue. Placement of the colors on the shell may vary slightly from the picture, as I do not take new pictures each time a New Snippy is created.. Snippy's body is bright grass green. His eyes were embroidered with black yarn. Snippy is 7 ¾ inches (19.7 cm) tall to the top of his antenna, 7 ¾ inches (19.7 cm) long to the tip of his tail, and 2 ¼ inches (5.7 cm) wide. Snippy was designed and crocheted by me, in a smoke free, dog loving home. Care instructions: Like most of my critters, Snippy is machine washable on delicate, using a pillowcase or hosiery bag. He can be machine dried on low or just re-shaped and allowed to air-dry. Shipping: Within the U.S. I ship USPS First Class Mail with Confirmation. For international, including Canada, I ship USPS international first class with confirmation, where available. I would be happy to ship by another method if you would prefer; just contact me prior to purchase. I always combine shipping for multiple item purchases made at the same time. International customers are responsible for any customs duties levied by their country.